The Institute of Hospitality London Branch holds the 10th Student Learning and Development Forum at Glion Institute of Higher Education London on 17. November 2015. The branch has worked hard over the last year to put together a great agenda for the day: The event brochure includes details about the day including an agenda, information about all speakers, the companies sponsoring the event and the education institutions attending. The topic of the day is ‘Hospitality! What it takes to be successful…’. A number of panel discussions and presentations are lined up to provide you with some useful thoughts and guidance on starting a successful career in hospitality. The panellists and speakers will give students some pointers and ideas, but also challenge their current views by giving you some food for thought. However the event is not only about listening to the panellists and speakers, it is about students interacting with them, their fellow students, and the companies represented on the day. Students will make most of the day to get and get to know people and companies and expand their professional network: throughout the day they will have the opporuntity to ask questions, visit the company stands and at the end of the day, Glion Institute of Higher Education, London invites all attendees for networking drinks to celebrate a successful Student Learning and Development Forum 2015. The Institute of Hospitality is the industry’s professional body as well as an educational charity with the aim to support hospitality organisations and professionals in positions of management throughout their career, promoting continuous professional development (CPD) and reward hardworking talented individuals. The Institute itself is a leading awarding body, with a number of current programmes with some world-class organisations. The Institute of Hospitality London Branch is the largest and one of the most active regional branches with a a full programme of CPD and social events to enhance careers, network, and have fun. The branch would be delighted to welcome members and non-members to one of our next CPD events – students of Educational Membership Scheme (EMS) institutions can attend these events for free! Find out more about the Institute of Hospitality and the branch events on www.instituteofhospitality.org. Please follow the London branch on Social Media to find out more: the LinkedIn groups are Institute of Hospitality London Branch and Student Learning and Development Forum; our Facebook page is Institute of Hospitality (London) and our twitter account is @IOHLondon. Please download the event brochure here. 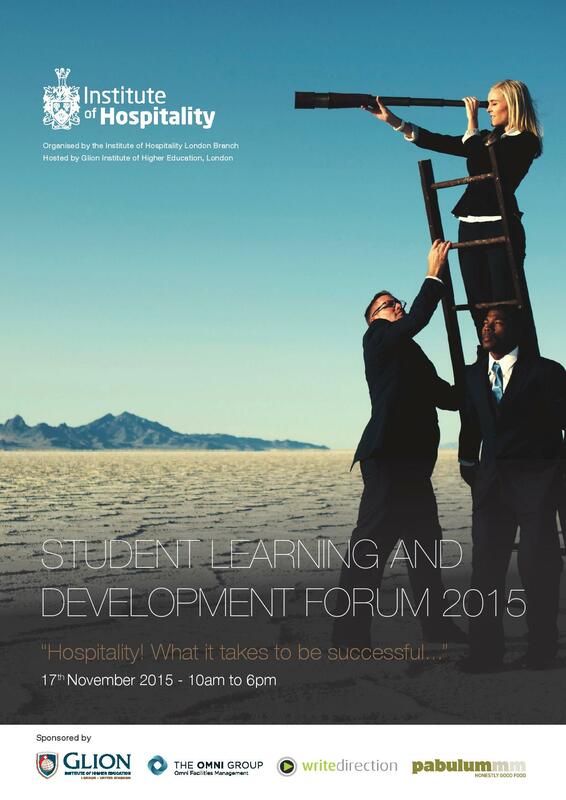 If you are talking about the Student Learning and Development Forum on Social Media please use the hash tag #SLDF2015.